Choosing the perfect wardrobe without acquiring a bunch of pieces that you rarely wear can seem daunting at first. 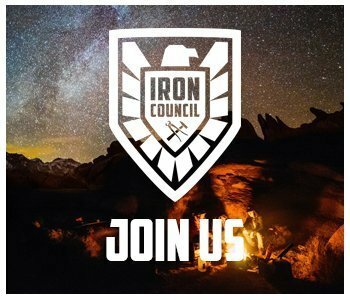 Fortunately, with a few key articles of clothing to begin your foundation, it will be much easier to build upon that base in order to create the optimal wardrobe for your lifestyle and taste. 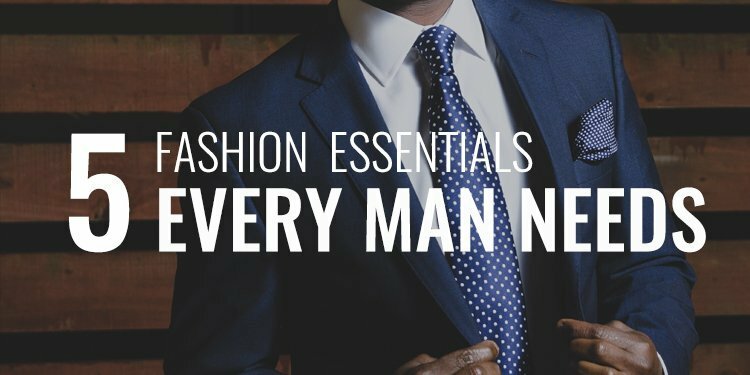 We’ve outlined the five fashion essentials every man needs to get his closet and appearance in tip top shape. Once you’ve obtained these items, you’ll be able to have fun with color, patterns, and personal touches in the future for a unique, well-rounded closet that’s a reflection of you. A well-fitting suit is essential to any man’s wardrobe. Work, job interviews, and meetings are all professional instances where you’ll need a tailored suit. Even if your occupation calls for casual attire, there are still special events that may require the use of one. 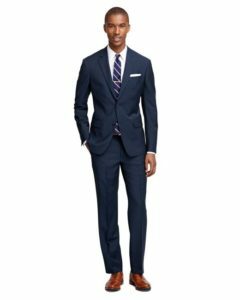 Weddings, dinner dates, and parties often ask that you arrive dressed to impress, and a quality suit like the navy blue Milano fit from Brooks Brothers pictured above will definitely help you achieve that goal. If you can’t afford a bespoke set, it’s perfectly fine to buy off the rack and bring it over to your local tailor for some minor tweaking. Whether they’re straight, wide, tapered, skinny, loose, or bootcut, jeans are a staple in almost every man’s wardrobe. The key is to choose a pair that actually elevates everything you wear them with, rather than contributing a more casual vibe. 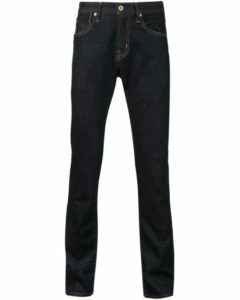 MensHealth.co.uk offers some great advice by recommending that you opt for the darkest pair of jeans possible and avoid any distressing of the fabric. Not only will this hide the rogue stain, but it will also keep you looking solid and well put together. 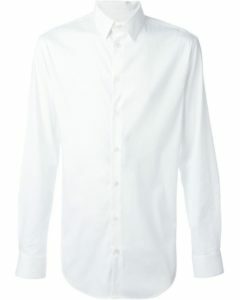 Esquire.co.uk recommends that all men invest in a white button down shirt because there’s not much it won’t go with—and we agree. Choose a white dress shirt that has a bit of elasticity and is at least slightly fitted through the waist to give your upper half a sleeker, more tailored fit. Avoid buying a white shirt for everyday wear that needs cufflinks, that way you can throw it on with a pair of jeans and head out the door. 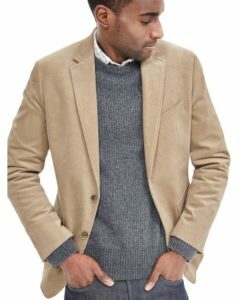 A blazer is a nice closet staple to own because it can dress up a pair of jeans and a T-shirt without the formality of a two-piece suit. The reason we recommend the color tan is because it will work well with dark bottoms, like the jeans we mentioned earlier. Wear a blazer to the movies, out to dinner, or to a party. Allow your choice in footwear and under shirt dress it up or down. 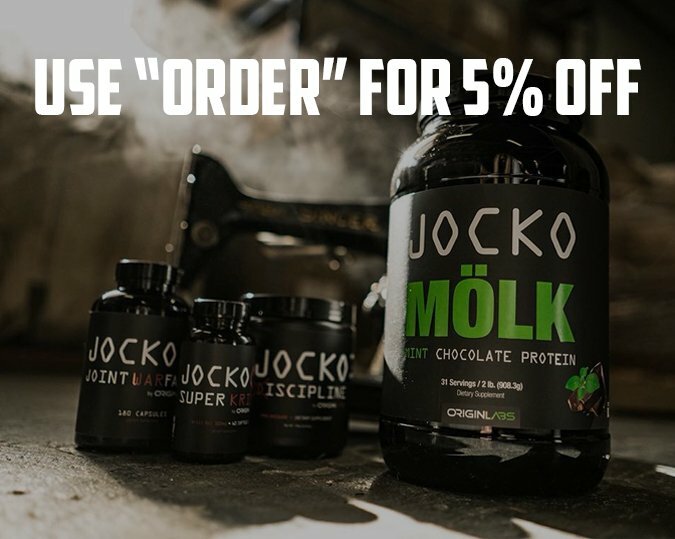 In addition to the pieces we’ve listed above, it’s important to have a few key accessories. 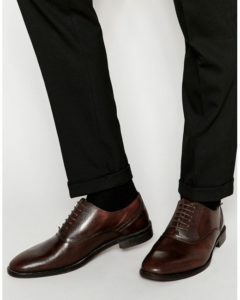 As seen on Lyst.ca, the handsome brown oxfords from ASOS pictured above are a wardrobe must-have, along with a matching belt. Brown is an appropriate color for most occasions, with the exception of formal and black tie events or funerals. And while you’re updating your footwear, throw in a nice pair of aviator sunglasses and a quality tie. Now that you’ve had a quick lesson on the five fashion essentials every man needs in his closet, it’s time to get shopping. When you’re out braving the department stores, have a list handy, keep it simple, and remember that sometimes less in your wardrobe really can amount to so much more.